Jidori had been piquing my interest ever since it first opened. Walking by on Kingsland Road, I couldn’t discern the cuisine, but the warm, soft lighting beckoned, and through the glass pane I could see the tables were full, with pairs of casual diners chatting at the wooden bar, the whole dining space framed by blue-grey walls lined with crockery and plants. The cuisine is contemporary Japanese, and when I finally walked in for dinner, TLC’s ‘No Scrubs’ started playing whilst I was served a Yuzu lemon slushy margarita. All my pleasure centres lit up at once, as if an algorithm somewhere was running to ensure maximum appeal to a broad, urban 30-something demographic. In fact, the responsible parties are Brett Redman and Natalie Lee-Joe, restauranteurs and co-founders. Redman has opened several popular places in London, of which I’ve only been to the Pavilion café in Victoria Park, a very different type of venue but again, one that knows its market very well. 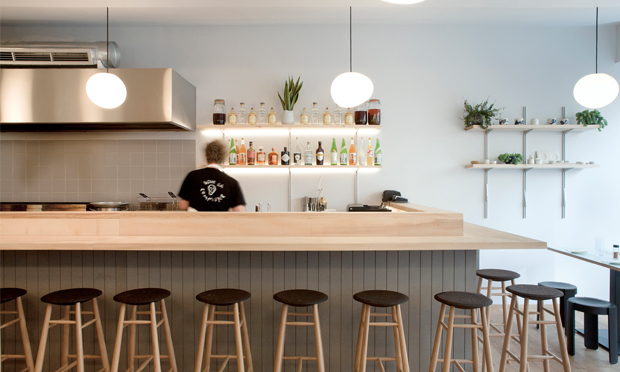 Whereas the Pavilion serves free-range breakfasts and craft beer, the vision for Jidori is yakitori – a casual type of Japanese cuisine centred on chicken skewers, cooked on a charcoal grill and washed down with copious amounts of booze. Although there are nice vegetarian highlights, I wouldn’t recommend eating at Jidori if chicken isn’t your thing. The menu is quite small and we had most of it, starting with the katsu curry Scotch egg, which, in the final reckoning, was a well-executed Scotch egg, but a Scotch egg nonetheless, so not exactly a rarity in Hackney. I then had a simple bowl of chicken broth. Broth well done is lovely and understated. This had depth and flavour and was as clear as glass, indicating the stock was simmered slowly and never came to the boil. Next, the omakase, a tasting platter for two, which for £18 each allowed us sample most of the skewer menu. 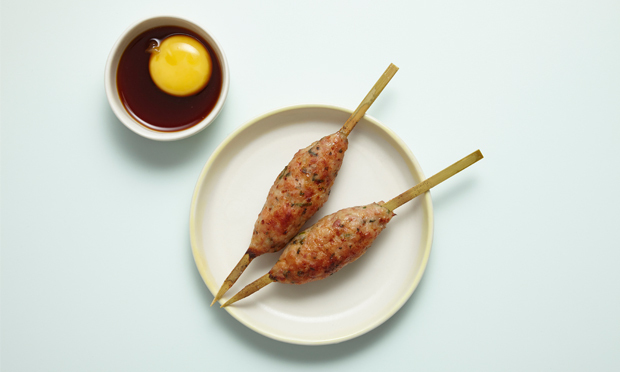 Chicken thigh and spring onion; aubergine and miso butter; chicken hearts and bacon; king oyster mushroom; and tsukune: minced chicken on skewer (think the consistency of kofte), dipped in raw egg yolk. The mushroom, hearts, and tsukune stood above the rest. The set menu included rice and pickles. It was supposed to also include an onsen egg, but this never materialised. We finished off with the ginger ice cream with miso caramel, which is a serious dessert and unmissable. Jidori is certainly not the only, or the most authentic, yakitori in London – perennial favourite Jin Kichi in Hampstead comes to mind – but it is inviting and cheerful, with attentive service. It is also good value – even with drinks you can eat there for less than £20 a head. With this winning formula, there may well be more restaurants to come from Redman and Lee-Joe.